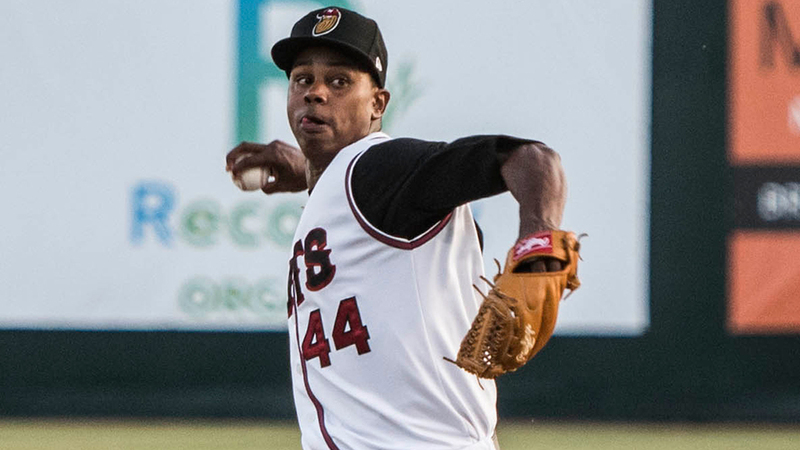 Yency Almonte earned a promotion to Double-A Hartford after a dominant July with Class A Advanced Modesto. He's picked up right where he left off. The Rockies' No. 20 prospect tossed a four-hitter for his first career shutout Wednesday as the Yard Goats beat Bowie, 4-0, in the first game of a doubleheader. He struck out four and walked three in the seven-inning game. "He's got a deceptive delivery and we've been working on the changeup with him; he used that well today," Hartford pitching coach Dave Burba said. "He used his slider for strikes and had some nice wipeout sliders as well." It was the 22-year-old right-hander's second Double-A start since being promoted on Aug. 6. He won his first outing in Akron, allowing three runs on five hits and two walks while striking out two over six innings, but incorporated his changeup more against the Baysox with impressive results. "The first start, he didn't use his changeup hardly at all, and I just think with him throwing his changeup today it kept them from sitting on the fastball," Burba said. "He threw his slider a lot better today as well, but my opinion is that using his changeup helped him keep hitters honest. ... He was mixing speeds throughout the count and did a good job of pitching today." Almonte (2-0) allowed a baserunner in every inning, but none made it past first base until there were two outs in the seventh. Sharlon Schoop singled and moved up on third baseman Michael Benjamin's error, but Almonte got Adrian Marin to ground into a game-ending fielder's choice. "It seemed like he got a little erratic every once in a while from the windup, and when he went into the stretch he settled back in, threw the ball down in the zone and made quality pitches," Burba said. "He was getting outs from the windup, but every time he went from the stretch, he walked in and made good pitches. It was almost like he pitched better from the stretch, and he wasn't in the stretch too often." The 2012 17th-round pick was far more effective with men on base. He retired 11 of the 12 batters he faced from the stretch -- the lone exception being Benjamin's error -- and threw 32 of 47 pitches for strikes while notching all four of his punchouts. In contrast, Almonte allowed seven of the 15 batters he faced from the windup to reach and threw 32 strikes among 57 pitches. "That's good to know because if he ever gets into any trouble he's comfortable in the stretch," Burba said. "He ended up turning two double plays that were huge to help him get through the game. When he did get some traffic on the bases, he settled in out of the stretch to make quality pitches and never lost his composure. He had to make better pitches, stayed under control and never hit the panic button." Almonte's strikeout numbers have been down since the promotion. After fanning 134 over 138 1/3 innings in the California League, he has six strikeouts in 13 innings with Hartford. "In Double-A the hitters have more discipline. I didn't really pay attention to his strikeout numbers in Modesto, but I know he can reach 98-99 mph," Burba said. "Our biggest concern is to teach these guys to throw strikes, keep the ball in the zone, keep balls down and get outs quick. He did that for the most part today. … He made pitches when he needed to, and that's what counts in the long run." Burba said he likes what he's seen from Almonte, but there is one adjustment he'd like to make to help the Florida native maintain his consistency. "My biggest concern is the rotation in his delivery; that's the first thing I'm going to attack," Burba said. "Our Minor League pitching coordinator, Doug Linton, was in town and we watched him throw. It's always nice to have another set of eyes. That was our analysis -- he over-rotates every once a while, but it's part of his deception. That was the dilemma, but we don't want to create inconsistency and we're going to have him keep the front side and shoulder on target a little bit more." Almonte pitched with a lead almost all afternoon after Dillon Thomas delivered an RBI double in the bottom of the first. Benjamin and Cesar Galvez, the eighth and ninth batters in the Yard Goats lineup, both went 2-for-3 with an RBI. David Hess (4-12) also went the distance for Bowie, allowing four runs on nine hits and two walks while striking out two in his second career complete game. The Yard Goats completed a sweep with a 2-1 win in the nightcap as Konner Wade allowed one run on three hits and three walks over 4 1/3 innings. Matt Pierpont (6-1) and Jerry Vasto combined on 2 2/3 innings of scoreless relief and Rockies No. 6 prospect Ryan McMahon doubled in a run.